Illustration by Christine Garner made using Blender. 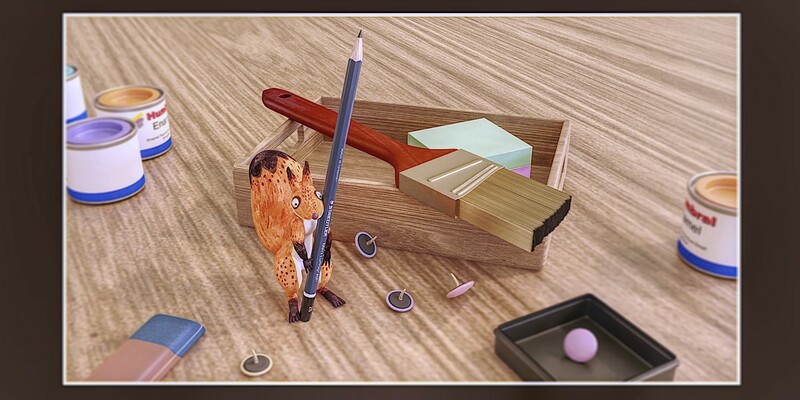 Starring the Art Squirrel…Some free models from Blend Swap and royalty free stationary set from Blender Market. 3D software can be useful for the digital 2D painter, illustrator, designer or concept artist. The world we live in is 3D. Artists usually start out by drawing from life models and landscapes or make art sculpture in the real world. If you open your mind to the possibilities of a hybrid creation approach with 3D and 2D you may come up with all sorts of creative ideas you may not have thought of before. This article will discuss some ways 3D art software can be used for 2D artists and Illustrators. I won’t go into technical details of how to do anything. I will list and discuss some ways 3D art software could be helpful and I’ll give you some links at the end of the article which you might find useful. Disclaimer: This article mentions a lot of free and paid software for 3D art and some 2D art and I’ve included links. I am not being asked, paid or sponsored to write this article, I like to write these articles because it helps me learn about the subject more and I like sharing information if it’s useful. My illustration portfolio website is at thimblefolio.com. Just browsing Sketchfab might inspire you to try drawing lots of different things from different angles. Useful on rainy days or if you don’t have access to a real model to study from. You could practice drawing from different angles by rotating the model and if you press ALT and left click drag left/right you can change the light direction on models as well. Windows 10 has a 3D Viewer now which also lets you view 3D models on your computer without needing complicated software to do so. You can use models you have on your computer or view ones in their library. It is worth noting this is fine for personal study and practice, but you would have to make sure you used a royalty free 3D model and didn’t plagiarize anyone if you were going to use it in an illustration. Just like with any use of photo reference or looking at other artists work, you have to be mindful of copyright. The more you study 3D form and how light works the more you will understand it and this will be reflected in your general drawing and painting practice. Knowledge of geometric form from study makes it easier to create your own imaginative drawings. You could create your own little digital 3D model sets for your world and then take pictures of different angles and lighting for reference to draw from. Traditional artists often do this by making models from clay or other materials. James Gurney is a good example of a traditional artist who makes 3D sets and models for his own reference. I don’t know if he uses digital 3D, but sometimes he talks about it on his blog. His book Imaginative Realism goes into these model making techniques for creating paintings and illustrations in detail. The only difference to the traditional approach is that the digital 3D model is in the computer. Both methods have their advantages and disadvantages, although I suppose you could get your digital world 3D printed into the real world as well if you had a house the size of the Warner Brothers studio. Creating different compositions, camera angles and lighting scenarios with 3D objects can be a fun and creative thing to do and might give you ideas to take to your 2D illustration. This approach is similar to the one above, except it uses the render of the 3d scene, character or object for direct editing into a finished illustration rather than using as reference and drawing it from scratch. Leo Hartas also describes this technique in his book How to Draw and Sell Digital Cartoons. His book although fairly dated now as it was published in 2004, is a very useful introduction to the different aspects of the 3D workflow for beginner comic book artists as well. If you are rich you could ask someone to do the 3D modelling for you, or you could use free or paid 3D stock model library’s on the internet. In Scott Robertson's How to Draw book he has a section on using 3D programs for quickly blocking out the proportions of large volumes and moving the point of view around. It’s a time saving device in working out a perspective structure for your drawing. Caveats are that you still need to know how to draw and have a working knowledge of perspective otherwise you would spend more time modelling the little details in the scene than drawing over it. Even line art can be made from 3D objects by using Non Photo Realistic shaders (NPR). Have a look at how Tony Leonard does this with ZBrush if you are curious. The new 2019 version of ZBrush has recently created many different NPR art styles for use with the software (non photo realistic). NPR renders can also be created using other software such as Blender. Toonkit for example is a popular add on that helps NPR artists make cartoon style renders of their 3D objects. NPR is a popular style. Spider-Man: Into the Spider-Verse used different techniques to make a seamless blend of NPR 2D and 3D styles for example. Many computer games do so as well, such as Rime and Ori and the Blind Forest. They have a very stylized look. If you are interested in Blender in particular, you may want to look into the grease pencil feature. In the new version of Blender (2.8) artists like Jama Jurabaev are basically drawing in the 3D space without needing to model anything. I think the strokes are converted to curves and then made into 3D geometry which can be rendered out. Personally I think it’s a smart move using 3D for complex illustrated scenes which require correct perspective and lighting from different angles and this is why I wanted to learn Blender at first. I saw a few articles by David Revoy on the subject of mixing Blender with Krita which sparked more of my interest in this technique. Many successful digital artists use Poser to help create artwork, like Brian Haberlin for example. 3D objects can be used from different angles to create a library of elements you could use in kit-bashing techniques or for making digital brushes and stamps. If you made the 3D render into a silhouette or a black and white basic lighting render, many different shapes could be created from one objects by changing the angle of view. Sites like PixelSquid are a resource where you can download different views of 3D objects as 2D images. You could also do this by rendering any 3D object you have from many different camera angles in your chosen software with a transparent background. Essentially it is stock art using 3D models for graphic designers and digital artists. Artists can make their own 3D objects or download models for this purpose. With tight deadlines ready available resources can very useful. Sites like Kitbash 3D offer 3D kit-bash elements for concept artists. There are many other 3D resources on the internet for this 3D kit-bash workflow approach made by 3D modellers for this use and in the faster creation of 3D models in general. If you work in Illustrator, Affinity Designer, Inkscape or any other vector based graphics creation program, your vector graphics can be converted into 3D mesh objects in some 3D software. You could use them in a 3D scene or you could export renders of them and use them in your 2D graphics applications. Blender allows you to do this, Sketchup can export 3D models as vector files if you need that functionality, or you could try Rhinoceros which has a 3D to 2D vector feature and is a curve based modelling software, making it more familiar to vector artists. As an example I’ve included a link to Moe Amaya on Dribbble who used this feature. Graphic Designers are increasingly adopting a 3D workflow with the help of programs such as Vectary which are designed to be easy to use. Adobe is also working on more 3D tools aimed toward 2D graphic artists, and recently acquired Substance Painter. It is working on something called Adobe Dimension. Specialist 3D mock up and packaging design software can get expensive such as iC3D, but it is more for specialist advertising use and the budgets in that line of work are usually very high. I thought I’d mention this technique as it is an interesting one, although I think it has to be used carefully and with discretion. I have considered this approach might be useful in saving time for creating lots of stylized backgrounds if you were doing a comic or animation. I know that it is used in architectural renders. There is a site called Sketchup Artists that has a section on this technique. I think it might be useful in conjunction with further digital editing /painting until it blended in with your own style or just for background elements which you could create in 3D first. You could also create unique textures and kit bashing elements for cutting up and using in future illustrations and concept art. Software such as FotoSketcher and Dynamic Auto Painter may come in handy for this technique. You can also get Photoshop actions which run different effects on photos. Those are some ways 2D artists and illustrators could use 3D in their workflow. There is so much 3D software available these days it is impossible listing all of it or for me to be aware of all the features of all the software, so I noted a few examples I knew of, but I have no particular preference myself (apart from Blender at present because it’s free and that’s the one I’m learning). You have to decide for yourself which software would be good for you if you want to try any of the techniques I’ve described. Links to software and books I’ve mentioned throughout this article are linked to at the end of this article. The good news is that new software seems to be focusing on accessibility and ease of use for beginners to 3D. The next version of Blender (2.8) is focusing much more on user friendly UI than previous versions, and software like Rocket3F have a user friendly UI. A lot of new 3D programs are web based so they are accessible to more people than before. Some is even made to be easy for children to use. This means it is becoming easier than ever to try 3D art out without investing a lot of time and money into it. My previous article on digital sculpting software mentioned web based SculptGL and SculptFab, as well as desktop software. Smoothie 3D is another relatively easy web based 3D software you could try as it makes 3D models using 2D images and no modelling or sculpting skills are needed. In the future virtual reality 3D modelling will probably become more affordable and accessible as well, who knows…I haven’t really looked into that yet. You could even try Photogrammetry if you want to create 3D reference objects from the real world with photos. If you have an inkling that 3D may be for you give it a go sooner rather than later, because it takes time to learn, but if you do it for just one or two hours now and then it adds up and gets easier to do eventually.